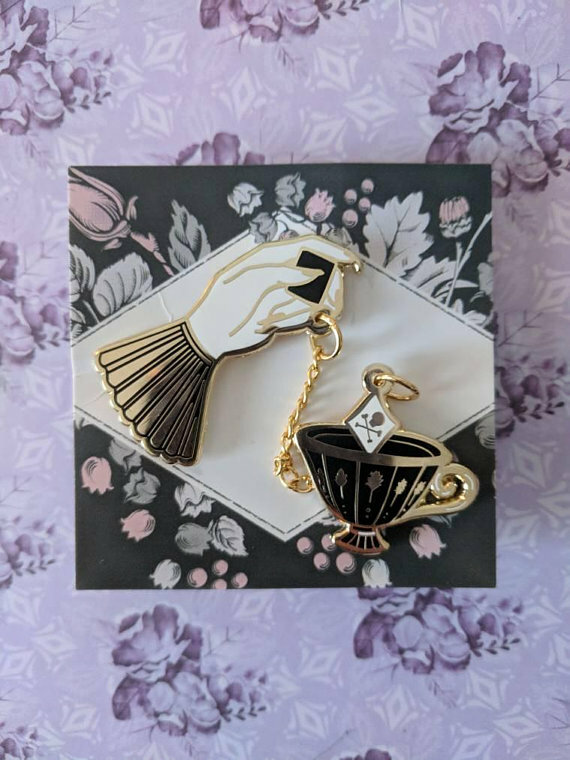 Let me, brooch...er I mean broach the subject of enamel pins. I never thought I'd be a pin person, but it started with the Pale Muppet Kermit Enamel Pin from Creepy Co. I couldn't resist, plus with my horror box subscriptions there's often a really cool pin included in the box, so there you have it, I wear enamel pins now! 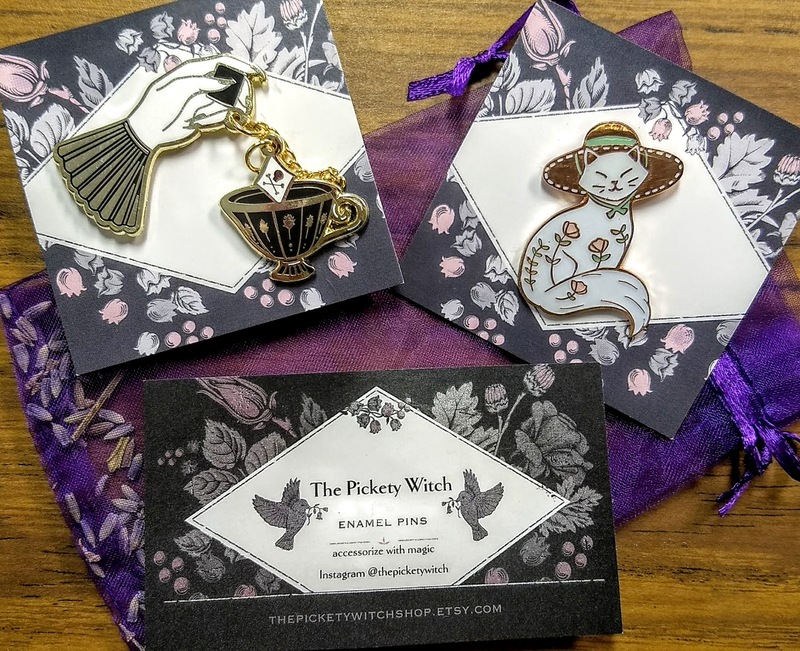 Recently I discovered The Pickety Witch Shop. I think it popped up as an ad on my facebook page or something similarly creepy. (I swear social media sites are inside our heads.) 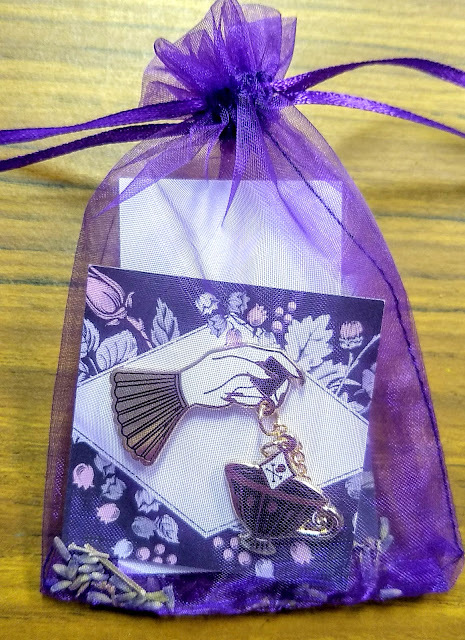 Anyway, I went to her etsy and saw The Poison Tea two piece enamel pin and fell in LOVE. I'm a tea junkie. 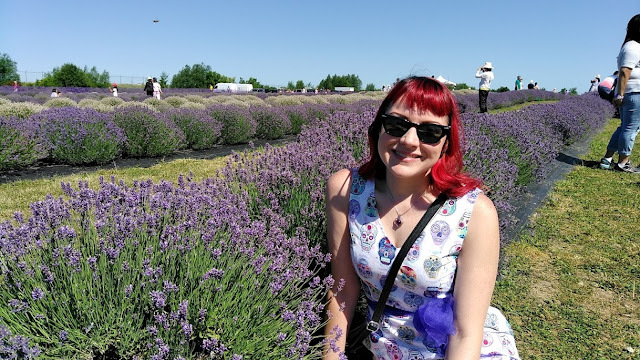 I had a tea party themed 40th bday, a tea tasting party a few months ago, went to a tea blending class, I read books on witches and tea, and I'm trying to learn how to read tea leaves. I haven't found anyone locally that reads tea leaves, so I'm trying to read as many books as I can on the subject and teach myself. I really need to practice more, and I wish I had more time to focus on it. Who knows?! Maybe I'll have a tea leaf reading party in the future! Needless to say I ordered this pin along with a "seconds sale" cat pin. They shipped pretty quick and came in a little jewelry pouch with dried lavender!!! I'm also a lavender junkie and attend the Niagara Lavender Festival every year. This shop gets me. I highly recommend them. Side note: I finally figured out what to do with all the pins when they aren't on my jean jacket...I bought a hanging banner pin holder from Krampus Cuties! 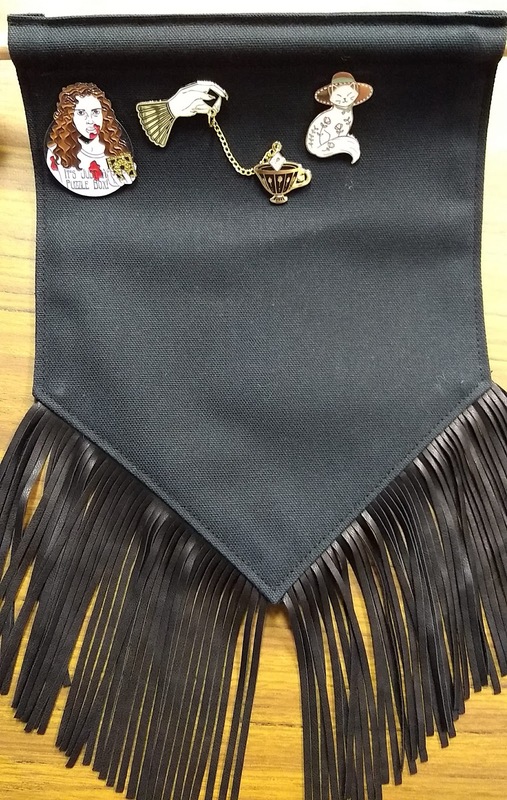 She makes super fun hair ties, and I model for her, but I'm sure if you ask nicely she can make a hanging banner pin holder for you too!